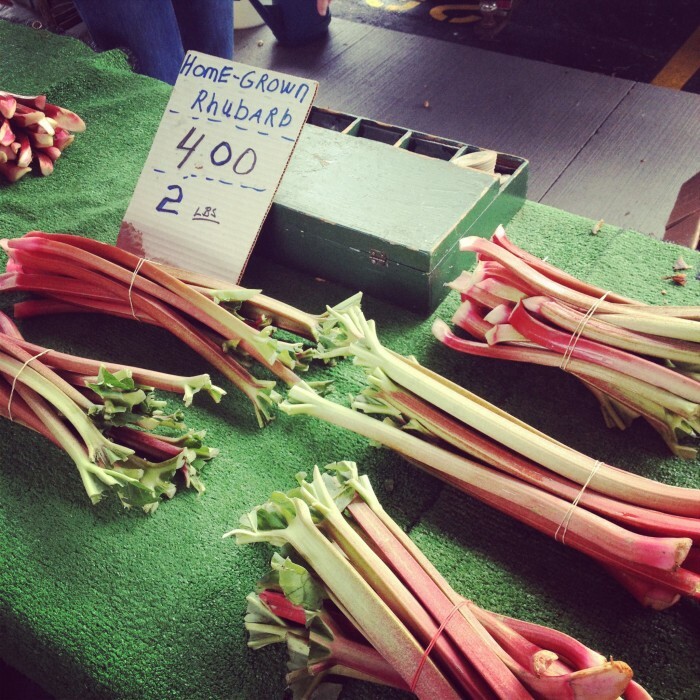 Rhubarb, as you surely know, is a harbinger of summer. It is, perhaps, the greatest sign we in the Midwest receive: the clearest, the most delicious notice that summertime is just the turn of a calendar page away. When those red stalks poke between the bunches of spring greens spread across the stalls at the market — those beautiful but endless green bunches, of which I am nearly weary, eager as I have become for the pending variety of the next season’s bounty — they remind me that summer is indeed coming, with its sunshine and warm nights and porch steps and baked goods with pockets of jammy fruit. As rhubarb’s season winds to a close, I am seriously considering the installation of that window box air conditioner sitting on my bedroom floor and wishing the long weekend had never ended, and I am almost sad, truth be told. But I shouldn’t be, not with berries and cherries and big juicy peaches and all else coming on rhubarb’s heels. Yet I wonder, did I appreciate this fully? Was I overeager? 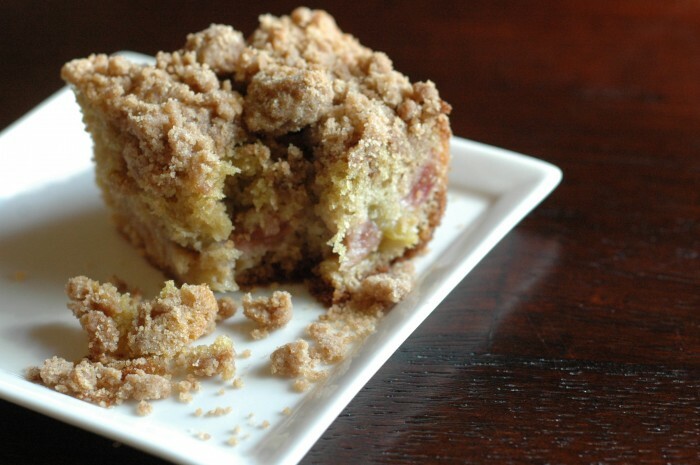 I wish I had made time, somehow, to experiment with a savory rhubarb dish, or to make at least one rustic tart with crinkly edges and a nutty crumb. It isn’t easy to explain, this feeling, not unlike the mix of sweet and tart in a rhubarb stem. And so I am reminded of the inherent worth of the harbinger, the herald, the one that comes between that which was and the noisier, seemingly more notable thing that is coming. However chaotic and headache-inducing and exhausting it feels today, the present will always be seen, in retrospect, as valuable and important. Transitions are good, waiting makes us grateful, working hard for the future we hope for matters. When nectarines and blueberries have arrived, and the next season of my life with them, I’ll think fondly of rhubarb and long to-do lists and collections of glassware for reception tables and saying goodbye, slowly and what it was like to worry about an entirely unknown future. And today, I will think not of what rhubarb signals, but just of rhubarb, nothing more, and of its mysterious vegetal nature, and of the endlessly delightful baked things that can encase it, and of how grateful I am to love people so much and have a life so beautiful that saying goodbye aches like this. In conclusion, a poem I wrote last year, at just about this time. It still fits, albeit differently, and I’m glad for that. When I baked this (not so many days ago), I know that I decreased the sugar with pleasant results, but, unfortunately, I cannot recall in which component(s) I did this, nor to what degree. And I did not write it down, because I thought I would remember. But if you’re interested in doing the same, start with a slight decrease in the sugar used in the rhubarb filling so that its tartness can shine through the sweet of the cake. A final note pertains to the crumb topping, which Melissa describes as coming together in a solid dough. Mine did not, and per comments on her New York Times version of this recipe, it seems I am not alone. 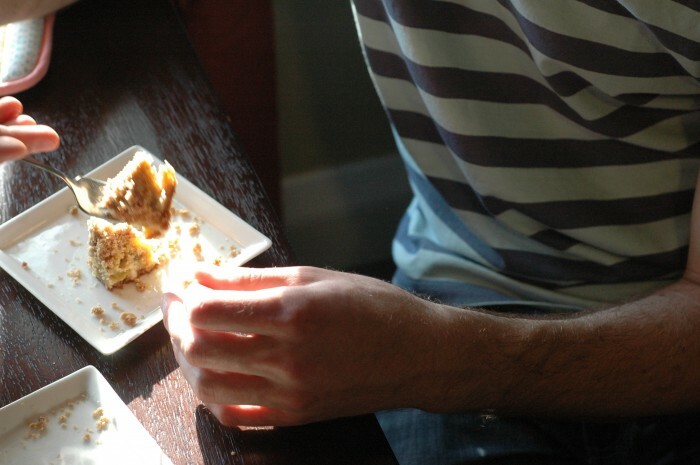 If this happens to you, squeeze any loose crumbs together to make the topping, and all shall be well. Preheat the oven to 325 degrees. Butter an 8-inch-square baking pan. To make the rhubarb filling, trim the ends of the stalks, and then slice the stalks in 1/2-inch pieces. Toss with the sugar, cornstarch and ginger. 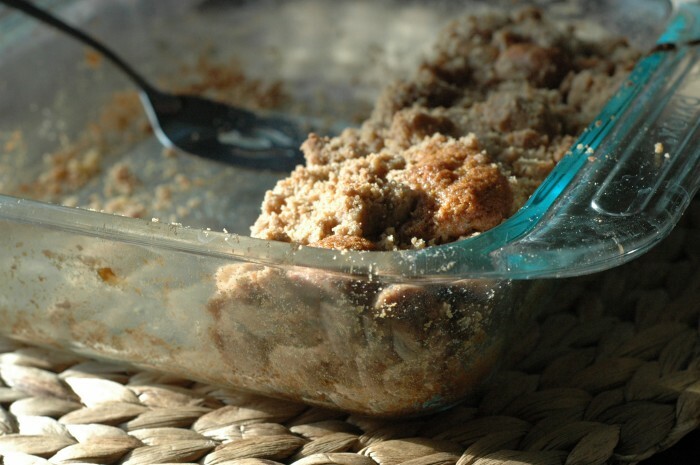 Let the mixture macerate while you prepare the crumbs and cake. 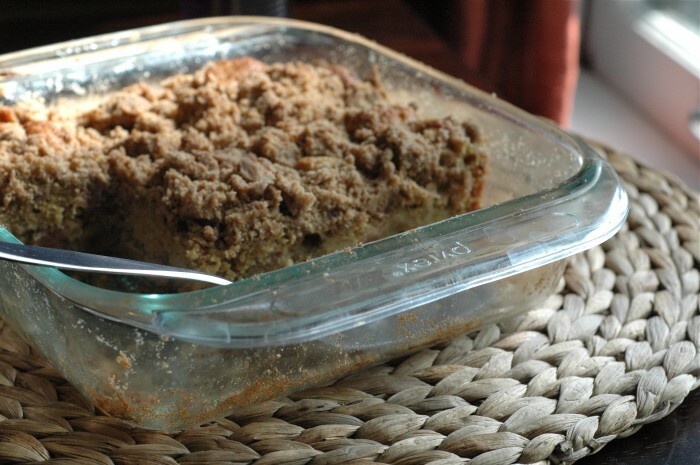 To make the crumbs, in a large bowl, whisk the sugars, spices, salt and butter together until smooth. With a spatula, stir in the flour until the mixture more or less comes together. To make the cake, in a small bowl, mix together the yogurt, egg, egg yolk and vanilla. In another, larger bowl (or the bowl of a stand mixer), combine the flour, sugar, baking soda, baking powder and salt. Add the butter and a spoonful of the yogurt mixture. With a handheld or stand mixture, mix on medium speed until the dry ingredients are moistened. Increase the speed; beat for 30 seconds more. Add the remaining yogurt mixture in two batches, beating for 20 seconds after each addition and scraping the sides of the bowl with a spatula. Remove about 1/2 cup of batter; set aside. Scrape the remaining batter into the prepared pan. Spoon the rhubarb on top. Dollop the remaining 1/2 cup of batter over the rhubarb (don’t worry about evenness). 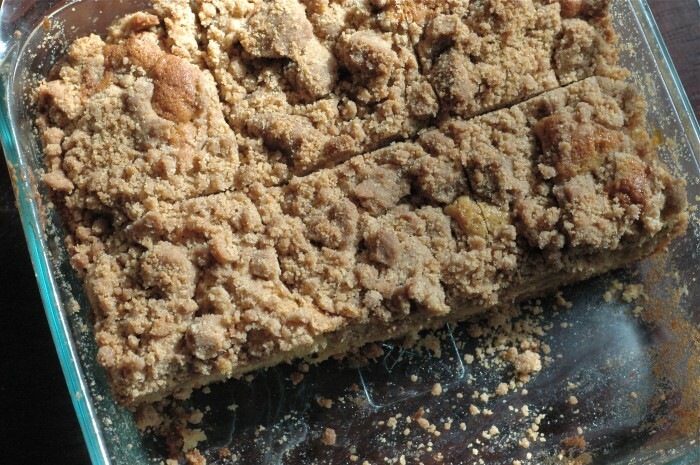 Break the crumb mixture into large pieces, approximately 1/2 inch to 3/4 inch in size. Sprinkle them over the cake. Bake the cake until a knife inserted in the center comes out clean of batter (though perhaps not rhubarb), 45 – 55 minutes. Cool completely before serving, and then enjoy! I’m glad I stumbled upon your blog–I love it! 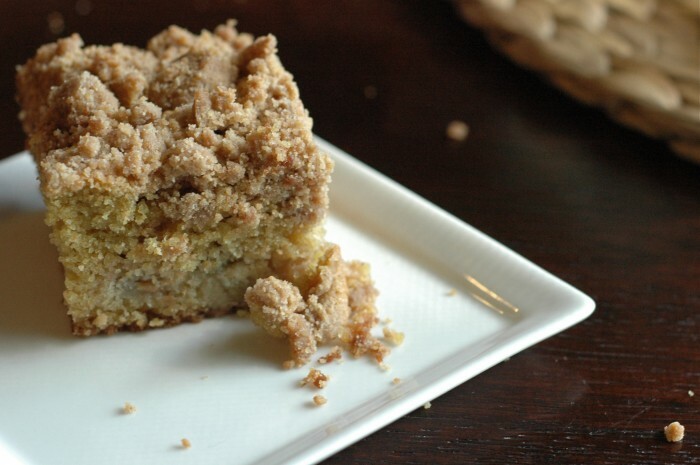 The crumble looks delicious! I am glad you stumbled here, too! Thanks for your kind words. We were privileged to have this wonderful cake last Monday. It was wonderfully. Thanks for sharing it. I love rhubarb!! As it happens, this isn’t the one you ate… You ate this. But quite similar, indeed!